It’s with a tad bit of sadness that we report this news about Motorola. For those of you who don’t know the history of everythingWM, we started back in 2006 as EverythingQ. Our site quickly became the number one community for Motorola Q owners. With Motorola moving to Android, we too migrated to everythingWM, allowing us to expand our coverage to include all Windows Phone devices. We’ve got a soft spot for Motorola and our hopes were to see the company get back to manufacturing phones, now that Microsoft has released Windows Phone 7. 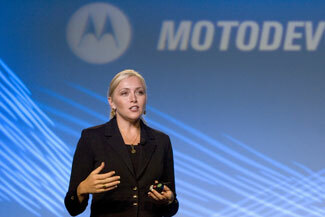 According to Christy Wyatt of Motorola, that time isn’t coming soon, if ever. “I don’t envision us using Microsoft. I would never say never but it’s not something we’re entertaining now,” said Wyatt. The company proudly boasts of being 100% committed to Android and believes that Microsoft’s “closed” OS prevents them from “creating unique value”. Wyatt believes that Motorola could only offer “commoditized hardware” if they were to manufacture phones running Windows Phone 7. Motorola makes excellent hardware. It’s a shame they wouldn’t want to compete on hardware alone and add some diversity in their product portfolio. Diversity makes only sense if you can produce quality. With WP7 you have products like Swiss cheese: holes everywhere. So why Motorola should offer crippled products? Wow what a moron. Hasnt WP7 recieved great reviews across the board, especially in terms of software quality? Android quality is good as well, but with so many versions I would think Motorola should be concerned with product continuity, something that wouldnt be an issue with WP7. At least not yet. By “unique value” they must mean bloated and unnecessary crapware…err I mean “blur”. I simply don’t get why they would want to spend the time, money, and resources investing in crappy front ends that don’t add any value for the user. It’s simply a waste. I am not sure why manufacturers continue to insist on putting Blur, TouchWiz, Sense on Android phones. They see it as “creating unique value”, when consumers would prefer stock Android. IMHO, I’d take the stock OS over any of the unique value any day. What did the xbox 360 do to the patients? At least the video game could give them some entertainment while they are recuperating. Motorola slams MS and Nokia… but their own market share is being slaughtered. Their advice – to continue being slaughtered and do nothing different. Those losing usually scream the loudest that others are worse off than they are. The future is cloud with this said, why would you place your valuable information with a hardware manufacturer. I’d rather place my valuable information with a stable software giant who can guarantee me scale and my dad being available in 10 years time. The problem with android is its too fragmented when I fall out of love with Motorla and like the new HTC handset some of my personalisation and data is going to be left behind at Motorola and I have to start again with HTC. Why would you risk putting all your data and faith in a new upstart that might pull the plug after the cash stops coming in the door due to a heavily saturated Android market. With windows mobile you have a consistent experience across handsets. It’s dissapointing the hardware manufactures didn’t seize the opportunity to ditch the money on software development and focus on form factor of mobile phones. Explore nd give us some really great personalised devices. Mobile phone ergonomics is still very poor. The best revenge is to be successful. Have outstanding phones, on time updates and future phones coming on line. Buildup the app library and just don’t look back. I’m glad to hear this, because I haven’t had a Motorola device since 1998 and don’t plan on ever purchasing one. Motorola and Android are a match made in heaving; Motorola’s losing ground and Android is one big mess of an OS. Nokia + WP7 = Powerhouse. Microsoft are absolutely desperate for a manufacturer to get 100% on board with WP7. It sounds like Nokia is that manufacturer. But is it too late? How long will it be before Nokia are up to speed, and churning out the hardsets? Microsoft need something big, and they need it now. Otherwise WP7 will just keep lagging behind all its competition. Motorola shuts the door on Windows Phone after MS refused to work with them and sued them. That’s the first time in many years I’ve heard anyone say Motorola makes excellent hardware. The couple I’ve ever had didn’t even make it to the end of my contracts… and they’re the only ones I’ve had that didn’t make it, so I’m not careless. If you visit our forums, you’ll still see a ton of people using their original Moto Q’s. I like their build quality. To be honest, not sure i actually see the value in WP7 or Android for a hardware company. 90% of the OS is going to be exactly the same on every single phone, regardless of manufacturer .The only difference is Android allows a bit of front end customisation. Nice, but you’ve got to wonder how much point there is, when such a large percentage of Android users get rid of the default UI and build instantly anyway. Can’t say i’d bother with either, unless i could produce an extrodinary piece of hardware that stood out from the crowd. At the moment, thats a lot easier with WP7, as theres very little hardware about.